Jayaram Subramaniyam (Malayalam: ജയറാം സുബ്രമണ്യം; Tamil: ஜெயராம் சுப்ரமண்யம்) (born 10 December 1965), commonly known as Jayaram, is an Indian film actor and , who is a prominent film personality in both Malayalam and Tamil cinema. He has been acting in Malayalam films since 1987 while also enjoying popularity in Tamil films since 1993. Jayaram Subramaniyam was born into a family of Kerala Iyers in Perumbavoor, Kerala. He completed his bachelor's degree from Sri Sankara College, Kaladi. When he was studying there, he won several awards in the state level for mimicry. After college, he joined Kalabavan, a professional mimicry troupe in Kochi. At the age of 23, he was introduced into the cinema field by script writer and filmmaker Padmarajan who gave Jayaram his launching pad with the 1988 film Aparan. Jayaram subsequently acted in Padmarajan's Moonnam Pakkam (198 and Innale (1989). Padmarajan became his mentor in his film career till the former's death in January 1991. He is noted for playing in Kamal's films during the late 80s and early 90s, in films such as Pradeshika Vaarthakal (1989), Peruvannapurathe Visheshangal (1989), and Shubha Yathra (1990) (all of them scripted by Renjith), where he co-starred with his wife Parvathy. He later did a film scripted by Renjith with the story by Jagathy Sreekumar, Viji Thampi's directional debut Witness (198 . He teamed up with Viji Thampi and Renjith in Nanma Niranjavan Srinivasan (1990) where he played a police constable who is in search of a criminal played by Mukesh. During the early 90s he acted in Bharathan's Keli (1991) and Malootty (1992). He has acted in several of Sathyan Anthikkad's films. Their first film was Ponn Muttyidunna Tharavu (198 . Around that time Jayaram played a supporting role in Sathyan Anthikkad's Ardham (1989). Thalayanamanthram (1990) and Sandesham (1991), were both written and co-starring Sreenivasan. Anthikkad and Jayaram later went on to make Thooval Kottaram (1996), Irattakuttikalude Achan (1997), Veendum Chila Veettukaryangal (1999), Kochu Kochu Santhoshangal (2000), Yathrakarude Sradhakku (2002), and Manassinakkare (2003). He co-starred with Mammootty and Suresh Gopi in Joshi's Dhruvam (1993). Other films with Gopi include Viji Thampi's Nagarangalil Chennu Raparkam (1990), Thooval Sparsam (1990), Jayaraj's Paithrukam (1993), and Sibi Malayil's Summer in Bethlehem (199 . He co-starred with Mohanlal in Bharath Gopi's Ulsavapittennu, Peruvannapurathe Visheshangal (1989) and Priyadarshan's Advaitham (1991). His association with director Rajasenan created many movies such as Kadinjool Kalyanam (1991), Ayalathe Addeham (1992), Meleparambil Aanveedu (1993), CID Unnikrishnan B.A., B.Ed. (1994), Aniyan Bava Chetan Bava (1995), Aadyathe Kanmani (1995), Swapna Lokathe Balabhaskaran (1996), and Kadhanayakan (1997). He also played Aravindan in Siddique's Friends (1999) in which he co-starred with Sreenivasan and Mukesh. In the 2000s decade his films include Yathrakarude Sradhakku (2002), Manassinakkare (2003), Veruthe Oru Bharya (200 , and Twenty:20 (200 . His roles include Karunakaran in B Kannan's Theerthadanam (2001) and Lonappan in Rajeev Kumar's Sesham (2002). He also forayed into Tamil cinema including roles in Gokulam, Purushalakshanam, Priyanka, Kolangal, Murai Mamman and Pathini. He played the roles of Dr. Kailash and as Ayyappan Nair in Kamal Haasan starred Thenali and Panchathanthiram. They first came together on screen in Chanakyan (1989). Recently he has done more supporting roles in Tamil, such as antagonist roles in Saroja and Dhaam Dhoom, and a comic role in Aegan. His movies have included Manassinakkare (2003) Njaan Salperu Raman Kutty (2004), Finger Print (2005), Alice in Wonderland (2005), Madhuchandralekha (2006), Moonnamathoral (2006), and Anchil Oral Arjunan (2007). In mid-2008, he played Sugunan in Akku Akbar's Veruthe Oru Bharya (200 . He had a couple of hits in 2009 with Sathyan Anthikkad's Bhaghyadevatha and Happy Husbands. In 2010 he again teamed up with Sathyan Anthikkadu for Kadha Thudarum. Jayaram is married to actress Parvathy (പാര്**വ്വതി), who is no longer active in films.Their son Kalidasan is a child film artist who won the National Film Award for Best Child Artist in 2003 for his second movie, Ente Veedu Appoontem.Jayaram also has a daughter, Malavika. The family lives in Chennai and Kochi. The actor courted controversy for describing a domestic help as â€˜dark, fat, buffalo-like Tamil womanâ€˜, following which various organisations and activists demanded an unconditional apology from him. The incident happened during an interview for the promotion of Malayalam movie Happy Husbands. 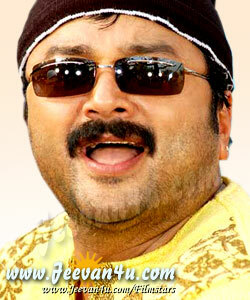 Jayaram's house in Chennai was attacked by Tamil activists and the actor deeply regreted on his comments. Last edited by BangaloreaN; 05-27-2016 at 09:39 PM. Last edited by BangaloreaN; 05-27-2016 at 09:40 PM. Last edited by BangaloreaN; 05-27-2016 at 09:43 PM. nice to see a thread for Jayaram..
all the best for this thread..
Purathekkulla Vazhi - ennu padam varunnundo? NB: Neelathama fame Kailash abinayikkunna padathinte peru TATA BYE BYE ennanu..ath aram pattum ennurappikkam... he will get tata bye bye from cinemas..